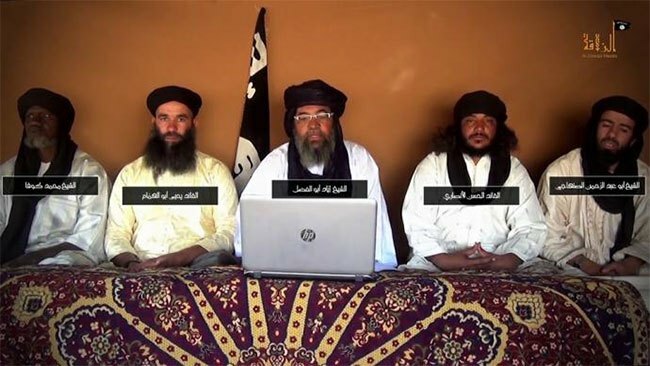 The Al-Qaeda-linked jihadist group, Jama’a Nusrat ul-Islam wa al-Muslimin (JNIM), has claimed responsibility for Friday’s deadly attacks on the army headquarters and French embassy in Burkina Faso. In a message released by the militant group through Mauritanian news agency, Alakhbar, the attacks were carried out in response to the killing of one of JNIM’s leaders, Mohamed Hacen al-Ancari, in a recent raid by French forces. The group, led by Malian jihadist Iyad Ag Ghaly, had already claimed responsibility for a February 21 attack near the border with Niger, which left two French soldiers dead and a third injured. Security sources and officials say the Friday coordinated suicide car bombings targeting French embassy and the military headquarters in Burkina Faso capital Ouagadougou left over 30 dead including 8 soldiers. The twin attack comes two weeks after a French army raid in northern Mali. According to French military sources, some 20 jihadists were “killed or captured” during the raid. French government said there was no French casualties and described the situation in Ouagadougou as “under control.” The former colonial power has deployed 4,000 troops to support a five-country military force to combat jihadists on the southern rim of the Sahara. The United Nations also has a 12,000-strong peacekeeping force in Mali called MINUSMA. Posted by Hafid El Fassy on March 5, 2018. Filed under Zoom. You can follow any responses to this entry through the RSS 2.0. Both comments and pings are currently closed.